Dental crowns are a restorative dentistry treatment that is used to improve the strength, look or shape of a tooth at our Jefferson City dentist office. Dental crowns are also referred to as “caps” because they cover the existing tooth like a hat or cap. A tooth crown is often used as the artificial tooth when it is the final reconstructive step in a dental implant procedure. Dental crowns can be made out of several different materials but most cosmetic dentists recommend all porcelain crowns. Porcelain crowns resemble the color and the texture of natural teeth and give the most natural-looking restoration result. When Should A Tooth Crown Be Used? As part of a root canal treatment to strengthen and protect the tooth. Once the dentist and patient determine that porcelain crowns or any other type of tooth crown is the best cosmetic alternative to restore a tooth, the tooth is prepared to receive the tooth crown. At our office in Jefferson City, preparation includes an x-ray to determine the condition of the roots of the tooth and the surrounding bone. If infection exists a root canal may be required first. The tooth is reduced so there is room for the tooth crown. The amount of tooth removed depends on the damage as well as the materials being used in the tooth crown whether its for porcelain crowns or another type of crown. The dentist will reshape the tooth and make an impression of it to make sure the restoration will be functional and provide a good bite. The impression is sent to a lab outside our Jefferson City office to create the tooth crown and match the color to the other teeth. 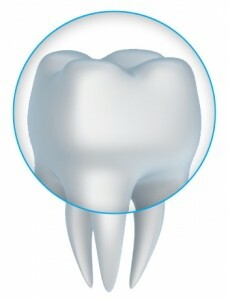 A temporary tooth crown is applied until the permanent crown is created, and cemented into place. Dental crowns are often used to secure dental bridges. Dental bridges replace gaps in your smile, usually one or a few teeth. Dental bridges can be permanent or can be removable. Removable dental bridges click on and off the dental crowns like a retainer. If you have questions about dental crowns or would to schedule a consultation with Dr. Johnson to find out if they’re right for you, please call, text, or contact us using the form on this page. We serve patients from Jefferson City and the surrounding areas, and we look forward to serving you.